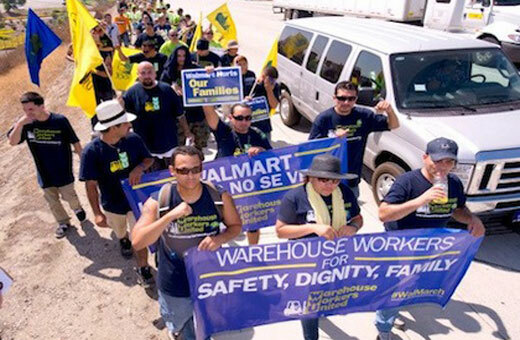 Workers employed by a southern California Walmart subcontractor are the latest group of workers for the anti-union retail giant to launch a protest for their rights. Workers at the Mira Loma warehouse went on strike Sept. 13 and began a 50-mile “Walmarch” from Riverside, Calif., to Los Angeles, determined to let Walmart shoppers know about the conditions they and 85,000 fellow warehouse workers face, demanding Walmart take responsibility for the unsafe conditions under which they are working. These include inadequate access to clean water, scorching heat that reaches well over 100 degrees, little access to health care, no regular breaks, and a lack of properly functioning equipment. Their wages are low – $8 per hour, $250 a week, or $12,000 per year. Workplace injury is common. The Mira Loma workers, who are temp workers hired by the staffing company WareStaff, do not have a recognized union. On May Day, several workers walked into the warehouse office to file complaints about the unsafe working conditions they faced. Soon after this action the workers were fired. “They spied on us and bullied us, all because we are fighting for dignity,” said Limber Herrera, a warehouse worker for four years. The workers say attempts to go through proper channels set by Walmart in its “Standards for Suppliers” have been ignored. Walmart is responsible for overseeing the standards of operation in the logistics and distribution industry, which impacts the lives of tens of thousands of warehouse workers in Southern California’s Inland Empire. 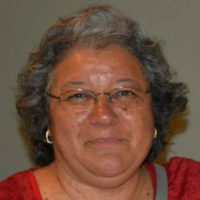 Supporters including clergy and elected leaders – among them Assemblywoman Norma Torres, a Democrat – joined the marching workers. They were also joined by members of the Organization United for Respect at Walmart (OUR Walmart), who are leading their own fight demanding that Walmart treat its associates with respect and dignity. “But we are not an isolated problem that will just go away: there are thousands of warehouse workers in Southern California, Chicago, New Jersey and elsewhere who labor to stock Walmart shelves – all facing similar conditions,” says a letter sent out via email. Supporters are asked to sign it. Click here. “Our work is unsafe, injuries are common, and the pay is so low we cannot make ends meet. Right now, the temperatures in Riverside and San Bernardino top 100 degrees daily, and inside the metal containers the temperature can get up to 120 degrees. There is little ventilation and the heat and pollutants we inhale can make us vomit and bleed from the nose. We face intense retaliation from management if we say anything about the conditions,” it says. The letter currently has over 20,000 signatures. The Walmarch will end on Tues., Sept., 18 at 11 a.m. at 200 N. Spring St. in downtown Los Angeles, where the workers will turn over to Walmart executives the petition signatures they have gathered during their 50-mile walk. Readers can show support by signing the workers’ petition, and if near Los Angeles, helping to welcome the marchers as they arrive in Los Angeles.